Although it’s not very popular around the world mushroom tea has been brewed for a while. Especially in the East China in particular. In China mushroom tea has been used as a medicine for many years. This tea is not only delicious but also very healthy. They are easy to make. Recently Four Sigma Foods a new Finnish company that specializes in this certain type of mushroom tea recently established their headquarters in Los Angeles. They are making their tea available throughout the United States and 21 other countries. They aren’t the only company, though; some other Indie brands have also started to pop up like Moon Juice, Buddha Teas, Terrasoul Super Foods, and Cap Beauty and more. So this type of tea is becoming very popular and here are some of the health benefits of mushroom tea. Mushroom tea helps us manage the stress in our bodies. Because of plant intelligence, it can determine what our body needs and wants; they then support us from the inside out which is a great feat. Too much stress can be very dangerous especially emotional stress if it sticks around for months or weeks then it can also weaken the immune system a lot and cause high blood pressure, fatigue, depression, anxiety and even in some cases heart disease which can lead to heart failure. To be precise, too much epinephrine is extremely dangerous for your heart. It changes the arteries and the way regeneration of their cells work. That’s why it’s crucial to manage stress otherwise it’ll affect your work or study and mushroom tea is a great way to do that. Mushroom tea uses cordyceps mushrooms in them, and it makes the immune function very strong. Many studies both Pharmacological and Biological have found that cordyceps are positively impacting immune function and it results in a benefit to the cardiovascular, respiratory, endocrine and reproductive systems. Not only that but cordyceps can also help you prevent cancer and many other immunological disorders because they have inflammation-reducing polysaccharides, modified nucleosides, and cyclosporines. Many animal studies have also demonstrated positive results in healing autoimmune diseases like leaky gut syndrome also anti-tumor activity in many different types of cancers when either natural or synthetic cordyceps supplements are administered. Some evidence also demonstrates that taking cordyceps supplements while undergoing chemotherapy can lower symptoms of the disease and enhance the body’s defense system in many ways. There’s also proof that they help regenerate normal fat mobilization and decrease oxidative damage, which helps nearly all chronic disease from heart disease to cognitive decline. That’s why mushroom tea is extremely helpful against diseases because it makes the immune function very strong. 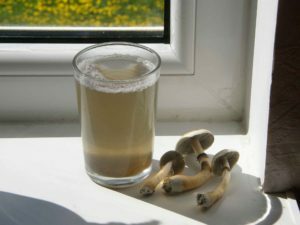 Mushroom tea is also full of vitamins and minerals. Because it uses Chaga mushrooms, it contains B and D vitamins, copper phenols, potassium, flavonoids, manganese, calcium, iron, zinc, and enzymes. It is also filled with rubidium, potassium, cesium and germanium; everything that is needed for your body to keep itsalkaline balanced. It is also full of over 215 phytonutrients, phytonutrients including Polysaccharides, Betulinic Acid, Tripeptides, Beta Glucans and Triterpenes including Lanosterol-type Triterpenes, Saponins, Sterols, Inotodiols, Melanin and Trametenolic Acid. It’s also very high in Dietary Fiber, Amino Acids, Ionized Trace of Minerals (Sodium, Calcium, Phosphorus, Chloride), B2 (Riboflavin), B3 (Niacin), Vitamin B1 (Thiamine), Vitamin D2 (Ergosterol), Zinc, Copper, Selenium, Iron, Manganese), Ionized necessary minerals (Magnesium, Potassium, which are often not found in vegetables. Mushrooms tea contains all of this and much more. Mushroom tea also keeps you balanced when it comes to hormones and prevents diabetes because of its effective use of reishi mushrooms in the tea. Research also shows that many antioxidants and anti-inflammatory compounds that are in the reishi mushrooms change the way the nerves transmit messages to the brain, enhancing various functions in the central nervous systems and endocrine and balancing hormones naturally. Reishi mushroom supplementation can be used to lower symptoms of diabetes, fatigue, and hormonal imbalances while enhancing fertility and reproductive health among other things. The Reishi mushroom also reduces the toxic amount of heavy metals that can accumulate in the body and cause sluggishness, one of the reasons why the mushrooms are related to improved energy levels, better concentration, more effective and improved memory functions and even better sleep. Many clinical studies also demonstrate that reishi extract exerts mild anti-diabetic effects and also improves dyslipidemia. Some research indicates taking reishi mushroom supplements for 12 or more weeks can indeed decrease severity and complications of type 2 diabetes since it doesn’t raise blood sugar while still increasing hemoglobin which is very healthy when it comes to your blood. Mushroom tea also enhances stamina and athletic performance because Cordyceps mushrooms are used. A study shows that supplementation with CS-4 (Cordyceps Sinensis) increased exercise performance in many ways and it contributed to adults overall markers of wellness. Especially within older people, it’s also considered an energizing adaptogen that can help fight fatigue, prevent weakness and treat muscle problems. Several other studies suggest that Cordyceps can increase physical abilities in more ways than one, stamina and endurance especially because they increase the body’s supplement of ATP, one of the main sources of energy while exercising. It’s also full of adenosine, a type of nucleic acid which is needed to make ATP. One 2007 study done by The Hong Kong University of Science and Technology shows that higher production of ATP keeps athletes up to speed during an intense workout and it also increased the time of the athlete’s activity during the workout.